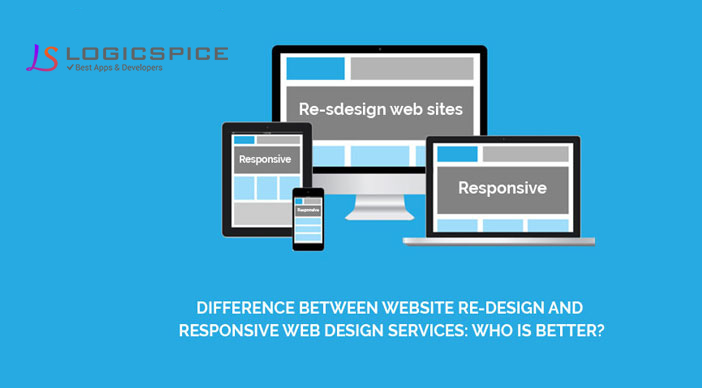 Difference between Website Re-design and Responsive Web Design Services: Who is better? Both are different topics, but important for all online businesses. The design of any website play vital role in their online marketing because we all know that “first impression is the last impression” all website design companies follow this quote to provide better web design services to their customers. And it’s true that if the customer doesn’t like your website design, URL navigation's, Images then you’re not sure that they come again to visit the website. It’s very simple and important part of any website owner and website designing company that provide web designing services globally. In this blog, I’m sharing two important part of web design. One is redesigning and second one is Responsive web design services. Both are different but both play same role in your website design. If business website doesn't look good or attractive then you need to re-design your website and if it’s not working for users then you need to build responsive web design. Website Re-design Services If you want to famous your website among your user or customers, then its need to grab consumer attention very fast and this can be done in several ways like user of different and attractive fonts and unique color combination, navigation links should also be well understandable. Your website background also helps in attracting reader’s attention. A professional team of designers can make a well attractive website and take care of the business requirements as well as the current trend in the design market. If you really want to re-design your website then you should be aware of the guidelines of search engine optimization. The important information that you must be having before start website re-design services, the current website, its visitors and their activities need to be monitored in order to identify the requirements of the consumers. This helps in effective website designing for the target audience. Responsive Website Services In today’s market responsive web services become popular and important for all online business that has a website for online consumers. There are many advantages for having a responsive website design. It’s not worthy for and you will not have to supply your potential visitors with multiple URL’s for accessing that web on different devices. It’s very simple that multiple URL’s means multiple websites that not nice for the user and you, because if you have so many websites, then you need to manage or maintain all these websites that could be tedious and expensive. The main benefit of responsive web design keeps you from spending extra money on designing multiple web pages or site for supporting different devices. Through this technology you can save your money and build a single website for all devices. With responsive website design services you can increase your chances for greater return on investment (ROI), since your website will become uniformly user friendly across different devices.